Bolt From the Blue: Guest violinist Lara St. John overcame an errant tuning peg in her performance with Symphony Silicon Valley. SO FAR this inaugural season, lightning has struck Symphony Silicon Valley twice, in virtually the same place. 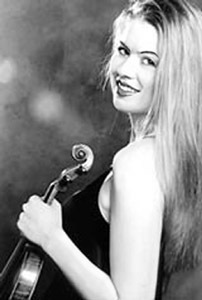 Last month, solo cellist William De Rosa was shocked to see his C string unravel just before his first-movement solo cadenza in Haydn's Concerto in C. Last Saturday, solo violinist Lara St. John was equally surprised when one of her tuning pegs came loose just before her first-movement cadenza in Prokofiev's Concerto in D.
But it's as much about the recovery as the crisis itself, and fortunately, both artists came through like the pros they are. For St. John, that meant stopping briefly to retune, a couple of times, to set a peg that was probably set loose by the low humidity that came in with the clear weather. However, her performance of the melancholy piece was less about the music and more about playing the violin and indulging a temperamental impulse. Instead of empathizing with the prickly composer through this unusually unguarded work, St. John seemed more intent on spirited display. Her ethereal opening sounded stealthy, ready to pounce. And pounce she did, displaying a vivacious technique that seemed at its best where the composer wrote more for effect than feeling. That, therefore, defined the success of the performance, where St. John showed off an unusually wide range of tone colors, not least throaty growls opposite steely harmonics. Accompanying St. John was guest conductor Theo Alcantara, a podium veteran who concentrated his attention on a score that calls for exotic effects and, in the middle movement, scherzo-vivacissimo, plenty of sizzle. Except for midcourse repairs required by the undone tuning peg, the performance came together handsomely. But the same could not be said for the beginning of Dvorák's Symphony in G, a work that has to lie familiarly under every orchestra's fingers and occupy every conductor's repertoire. Under Alcantara's lead, however, the first allegro found the winds and strings following different drummers. It happened twice before the performance found its legs. At last, attention properly turned to Alcantara's spirited conception of the piece, one marked by sharp contrasts between slow and fast, with underscored accents and shapely phrasing. Though management has chosen to defer the process of selecting a music director, the initial stumbles in this warhorse--and matters of balance in other spots--should give cause for reconsideration. These kinds of problems don't usually go away until an installed music director begins to sort them out. One thing was clear in the Dvorák: Alcantara had a generous and imaginative sense of the piece, as he previously did for Dominick Argento's Valentino Dances, the symphonic tango taken from the 1994 opera The Dream of Valentino, that opened the program. With the rhythm secured, the composer goes on to weave a vivacious arrangement of orchestral colors, replete with generous solos and cameos, especially favoring accordion (Barry Koron) and saxophone (Bill Trimble). The Pennsylvania-born Argento, now 75, doesn't display the same feel as Astor Piazzolla for the Argentine tango, but his score got excellent service from Alcantara and the orchestra. From the November 27-December 3, 2003 issue of Metro, Silicon Valley's Weekly Newspaper.